Culture is a one-of-a-kind hair care system designed for CUrly hair and unmanageable hair types. The products contain exotic ingredients from around the world and combined them into a unique product that cleans without over-drying, Removes frizz, hydrates without weighing hair down, and most important, lasts all day. 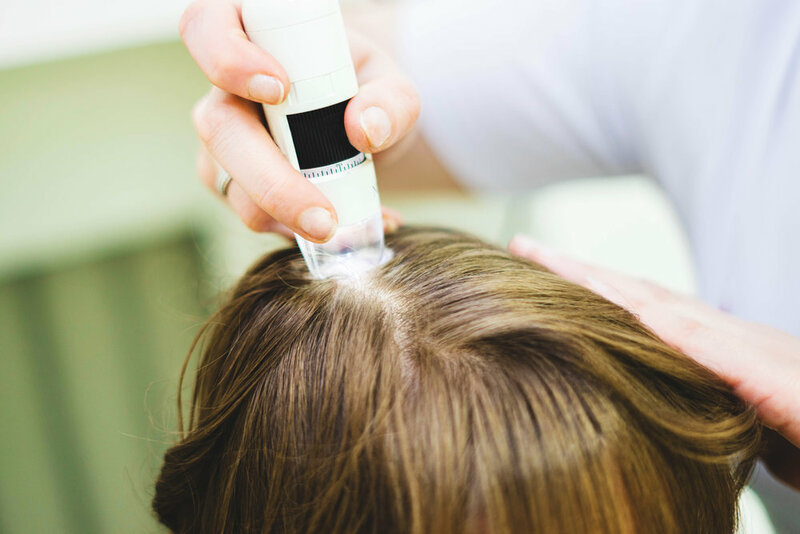 Scalp Scoping allows our trichologist to take magnified Images of the scalp to identify the health and disturbances of the Hair follicles and Hair Shafts. If you are experiencing hair loss, Thinning, Alopecia, Breakage, flaking, itchy, and/or inflammation of the scalp, A scalp analysis is recommended. With a Scalp Analysis, Our Trichologist will be able to diagnose the issue and provide the appropriate treatment plan to recover Hair Loss. This gentle Hair growth Treatment encourages hair growth and blood flow, while it decreases Inflammation. It is recommended for individuals with thin, wispy hair follicles. Significant results can be seen in as little as 2 to 3 months! The Steam Treatment provides Moisture, Strengthens Hair, Increases color Vibrancy, and promotes hair growth. it allows conditioners, oils, and other hair treatments penetrate deeper into the hair follicles. Hydrating Hair masque is a concentrated conditioner with an increase of fatty acids. This intensified Hair Masque will provide moisture and protection from Thermal styling and the environment. The Hydrating hair masque will strengthen, Improve scalp condition, Improve Hair Elasticity, and remove frizz. The end result will be happy, hydrated, silky tresses. The hot Oil Treatment moisturizes Hair and scalp, Stimulates Hair Growth, Returns Shine to dull hair, reduces Dandruff, and Prevents Frizz. This treatment is recommended for all Hair Types.